"In fact the wounds inflicted by these mines were so horrible that the other terran commanders morality forbade them from using the wicked things. Much to Vegas's satisfaction." I will begin with a short introduction before proceeding on to the report itself. You can skip to the conveniently emboldened "Part II" if you have no patience, or if you have no time, you should turn back now and get back to work, slacker! Why are you even here if you have no time? This was a game riddled with fear and incompetence. The ever-present fear of a massive, crushing enemy attack, and the incompetence to do nothing about it. Grave mistakes cost the lives of hundreds, and the battle raged for over forty minutes. A low-level game if I ever saw one. Many of you have played a similar game in your first months as StarCraft players, or at least seen a video commentary on one. I know I have. Now, before I start the report, I feel a word of explanation is in order, to account for the manner in which I will relate the goings on of this strange battle. I will begin from my point of view, analyzing my tactics and mistakes (mostly my mistakes), and I will then tell the tale again from the point of view of the Protoss, Dank. I don't want to spoil anything so I will only say that my reason for doing this will be made clear in time. As if that wasn't bad enough, I didn't have any Zerglings until after my 8 Hatch completed, and my Spawning Pool was placed next to my Extractor in such a way as to make the returning Drone take the long way around it if any other Drones were waiting to go in. I had done very minimal scouting with my Overlords: the first reached the 7 o'clock position shortly before the four-minute mark, and the second arrived at the 12 o'clock around the same time. I found nothing at either Main, so, just to be safe, I sent my first Overlord toward the 8 o'clock. Sure enough, I saw a Gateway and Pylon, and I pulled my Overlord away before it passed over the cliff. Around 4 minutes I had sent my first 4 Zerglings to the enemy Main, and I was now banking on the fact that he hadn't seen my Overlord. The Gateway had me worried that my attack would be repelled by Zealots on the ramp, so I sent 2 more Zerglings as soon as I could. I began Metabolic Boost for the Zerglings very late (4:29), which was about the same time my first 4 Zerglings were rounding the bend to the enemy ramp. I was surprised to find no units on the ramp, and as soon as I saw the Assimilator, I sent my Zerglings West and around into the Probe line. I had killed 3 Probes by the time my next 2 Zerglings arrived, but I didn't send them around the back and they ran into 2 very badly placed Photon Cannons. They died without doing any damage. At the same time, a Zealot arrived to silence my pesky Zerglings, but was surrounded and sent back to Aiur, after only killing 1 of the Zerglings. 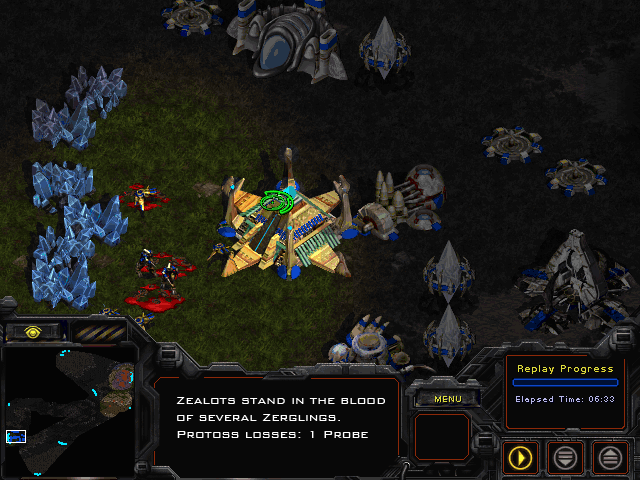 The Probes began attacking, and 1 managed to kill a damaged Zergling. As my remaining 2 Zerglings chased a Probe behind the mineral patches, I asked Dank to set the network to High Latency; this was at a time when I thought that would reduce lag for some reason. Meanwhile, I had 4 more Zerglings approaching the ramp, but I didn't know what to think: I was killing Probes and even took out a Zealot, but I was sure Dank would retaliate and break my early rush at any minute. Either I was confident about a quick victory, or I forgot about my base, because at this time, I was not producing anything, in spite of 700+ minerals and 300+ gas in my reserves. So, my 2 Zerglings chase a Probe into the Cannons and die, while my last 4 Zerglings wait outside the ramp. Metabolic Boost completes just as they enter the mineral line, but they attack a gas Probe within range of the Cannons and 1 Zergling is lost. The other 3 run away to the mineral line and kill a Probe before a Zealot arrives to terminate the 1st rush of the game. Unaware that the attack was actually cost-effective, I returned to base to make more Zerglings and Overlords. In fact, if you count gatherers at 25 minerals more than their cost (10 Zerglings = 250 minerals, 5 Probes = 375, 1 Zealot = 100) then the rush was 225 minerals in my favor. So, 6 Zerglings hatch and are immediately rushed to Dank's Main. Unfortunately, my attention is entirely focused on an early GG, so I throw caution to the wind and refuse to further my tech level with any buildings. At this point, I'm confident I can end the game with one more rush. Unfortunately, Dank had placed a Cannon and 2 Zealots next to his Assimilator. Despite the speed upgrade, I failed to move my Zerglings out of range of the Cannon, and the Zealots moved in to finish them off. Back at the Main, I decided to make 6 more Zerglings for another attack, and began mutating my Lair. I also planted two Evolution Chambers by mistake. However, I don't cancel the second one, because I'm preoccupied with expanding: I send a Drone to my Natural, unescorted. 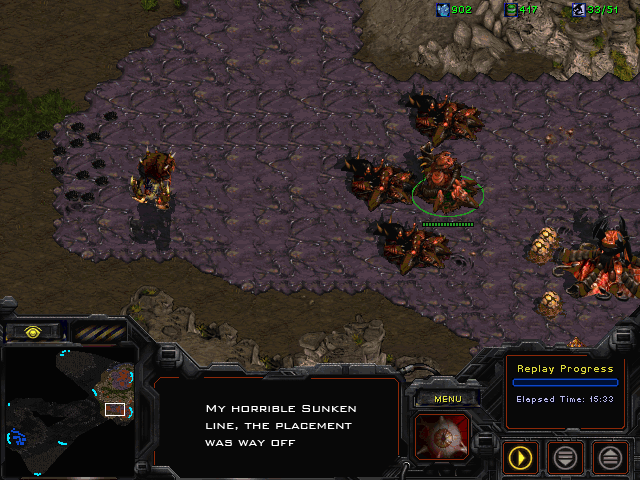 Even though I have 6 Zerglings sitting near the ramp, I don't even bother to scout the choke for an enemy force. Pure luck allows the Hatchery to begin mutating without incident, and I produce 6 more Zerglings to join the 6 at the ramp. I send all 12 Zerglings out toward Dank's Main, but then I turn them around. In anticipation of an attack, I place my full control group of Zerglings behind the wall that marks the map center. My idea is that once Dank attacks, I can send the Zerglings in behind his force as a defensive flank. Unfortunately, I have no other forces in my entire base, and still only the ability to produce Zerglings. I have too few Drones mining and don't even notice, but I begin researching Pneumatized Carapace (Overlord speed) and Level 1 Carapace once the Lair has finished mutating. I don't do anything else until the Hatchery at my Natural has gone up, and then, I research Burrow. This seemingly arbitrary move will prove to be vital in the upcoming encounters. 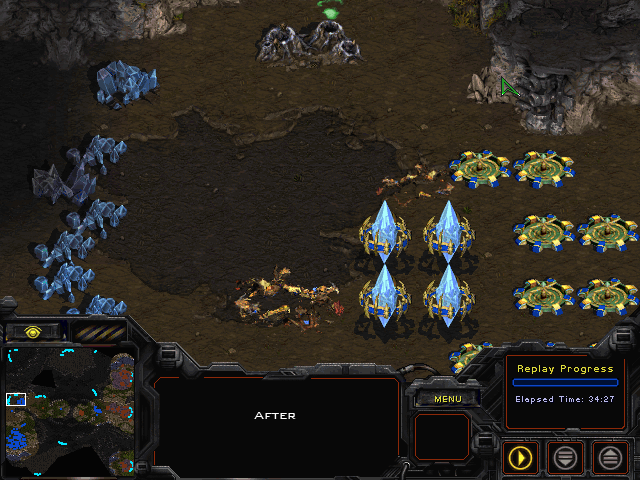 Having produced more Drones in my Main and begun mining in my Natural, I produce 10 Zerglings for another rush. All I have learned from this game so far is to not halt production while advancing my troops, so as the Zerglings run off to their doom, I produce 3 Drones and an Overlord, and research Ventral Sacs. This time, I gather my Zerglings together at the top of the enemy ramp, only to see them stretch out into a line as I send them around to the back of the Protoss Main. I assumed, of course, that there were no defenses in the back of Dank's Main; he had built a Cannon in front of his mineral line, where I attacked earlier, and reinforced it with 2 Zealots, as I saw during my 2nd rush. From that, I deduced that he was expecting further attacks from the front. Of course, it was much too far into the game at this point for a Zergling rush, but my assumption was correct: there were no operational Cannons at the back of the Main, and if the Gateway was placed anywhere else, the newly arrived Dragoon would not have been in any position to defend against the rush. I might have done some damage, but I didn't press forward to the mineral line, and allowed my Zerglings to spread. Most were picked off by the Cannons and Dragoon, and the 2 Zerglings that made it as far as the Probes only killed 1 before being killed themselves. Level 1 Carapace was nearly complete, now that my rush was a complete disaster: what irony. I then begin to form a defensive Sunken Colony line in front of my Natural. The placement is way off, and would allow an army to advance directly into the undefended Main. The Carapace upgrade completes as I place the second Creep Colony and a Queen's Nest in my Natural. At this time, I move my flank Zerglings ahead of the Natural choke and burrow them. I continue to form a sloppy defense, including a Spore Colony behind the Sunkens, and begin researching Level 2 Carapace. I also place a Spore Colony next to my Main Hatchery in anticipation of a Reaver drop, and then I begin mutating a Hive. At this point, I think it's important to note some of my major fallacies. I haven't attacked in quite some time, allowing Dank to repair his economy and build up his forces. I also haven't scouted his base, and have no idea of what he's doing. I also only have four available units for production: Overlords, Drones, Zerglings, and Queens. I was feeling a little hopeless at this point, because I had no idea of where to go from here. At the very least, I could try to do something crazy. So, I produced 2 Queens, and researched Ensnare, because I couldn't remember what it did. The Hive completed and I made more Zerglings and Drones. I placed an Extractor at my Natural. 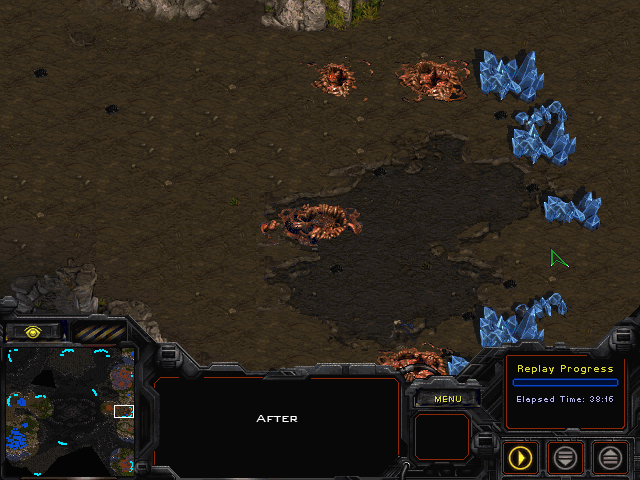 I left the Zerglings in my Main for defense and planted a Defiler Mound near my mineral line. Fifteen minutes into the game and I'm still only making Zerglings and Drones. Suddenly, 5 Corsairs appear outside of my Natural, and attack my Airborne Warning And Control System Overlord. They pursue it even into the range of my Spore Colony, and manage to get a kill without losing a single Corsair. I've only just begun my Ultralisk Cavern (in my Natural for some reason) and have no Spire or anti-air units. The Corsairs swing around to kill to more Overlords at my Main, and I burrow my Zerglings to hide my numbers (not considering that he might have an Observer). The Spore Colony scares off the Corsairs after they've killed 2 more Overlords. I replaced my Overlords and began researching Antennae, Anabolic Synthesis, and Plague. I placed a Spire when I really needed a Hydralisk Den, and sent my 2 Queens scouting for enemy expansions. I was preparing to go to battle, and I wanted to hide an expansion on one of the islands in case it didn't go off too well. I sent the Zerglings in first before the last 2 Ultralisks had arrived. I was expecting to run straight through to the Main like I had three times before, but I hadn't scouted ahead and ran into the force that Dank was forming on the other side of the map center. Dank's force consisted of the following: 6 Zealots, 4 Dragoons, and 2 Reavers. Most of the Zerglings died right away, before the Ultralisks arrived. I tried to collect myself and adjust to this unexpected event. The Queens were killed by the Corsairs from earlier, which joined the fight with a third Reaver, and I only managed to place one Dark Swarm, which failed to cover two of my Ultralisks. In the mayhem only the Defilers survive. 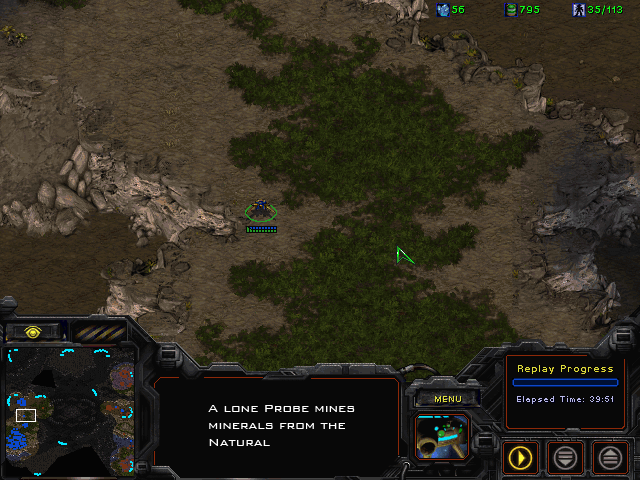 They burrow near the cliff of the Protoss Main. In reaction to the Corsairs, I produce Mutalisks, Ultralisks, and Zerglings. Still no Hydralisk Den. Meanwhile I drop some Drones at the bottom island expansion. I eventually unearth one of the Defilers that survived the attack, but it is killed before it can make an escape. The other Defiler remains and will act as an advanced warning scout for the rest of the game. Dank doesn't seem to notice this and continues gathering his forces within sight of my burrowed Defiler. Then, at 24 minutes into the game, I launch an Ultralisk/Mutalisk assault on Dank's gathering forces. He has not reinforced his position, so although I lose all 6 Mutalisks to Corsairs, the Ultralisks lay waste to the ground forces an move on to the enemy Main. 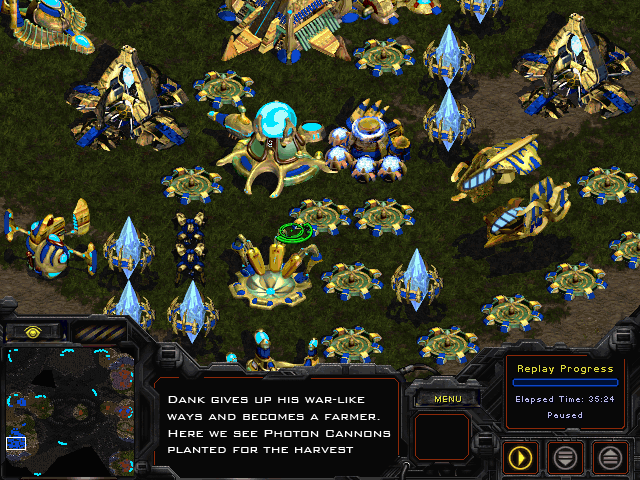 To my surprise, I come across a small field of Photon Cannons and a natural expansion. The Ultralisks run past the Natural and 2 are killed by a reinforcing Reaver. The remaining 4 Ultralisks move on into the Main rather than attacking the Probe line, but find even more Cannons than were there before. In the meantime, I've moved my Defiler to another spot for scouting, and produced more defensive flank Zerglings. I only now begin mining at the island, as I produce more Mutalisks and 6 Scourges. Then, foolishly, I send all 6 Scourges, alone, to destroy the seemingly invincible Corsairs. Dank says, "nice try" and I concoct a devious plan. I have a Greater Spire at this point, so I begin mutating some Guardians while I send a full control group of Mutalisks to sneak around behind the enemy Main. I lose 4 Mutalisks to the attack, so I send the remaining 8 up to the 12 o'clock Main to morph into Guardians. My plan is as follows: Guardians escorted by Scourges sneak in from the North on Dank's Natural. The Corsairs are sure to arrive, so once they begin firing on the Guardians, I'll send the Scourges to finally take them out. It's a pretty reckless plan, but even if I had Hydralisks for the Corsairs, they would never make it past that Cannon line. By the time the preparations had been made, and the Guardians were positioned on the cliff above Dank's Natural, I had a great excess of resources and could have massed a second force to attack the front, but I had lost all faith in my ability to win this game. So, I brought in the Guardians without any clever, or even foolish, front flank and no more support than 6 Scourges. That's right: for all my effort I only sent him back one Nexus. We were in the very late game period (almost 30 minutes), so 1 Nexus would only count for anything if it was the last Nexus on the map. After the attack has ended, Dank counters with 10 Zealots and 2 High Templar. I have about 40 or so Zerglings burrowed in and around the map center, so I focus and kill the 2 Templar in two waves. The Zealots, however, head out to my Natural, unhindered. They destroy my awful Sunken block and the Corsairs arrive to kill more Overlords. I respond with Mutalisks, Scourges, Ultralisks, and Zerglings. It's a sloppy massacre, with much of the action obscured by blood and scattered units. Only the Corsairs and 1 Ultralisk survive. For no apparent reason, one sole Probe appears after the Zealots are dead, only to die to the Kaiser Blades of the last Ultralisk. This is the point where the game goes into a slight lull. Apparently, there were also Dark Templar in the mix, but in the thick of battle I hadn't noticed. One had survived, and began to destroy my Natural. The Corsairs had killed every Overlord in the area, so I only knew the Dark Templar was there by the sound of his blades. There were too many Corsairs to bring in an Overlord, although I tried several times without success. Ultimately, 8.5 minutes pass before the Natural is destroyed by the lone Dark Templar. Meanwhile, I've built two Hydralisk Dens on the island, and quickly researched both Muscular Augments and Grooved Spines. I've also expanded to the 7 o'clock Main with a Drone drop. A few Corsairs found my island expansion, so I built a Spore Colony and produced 3 Hydralisks there. 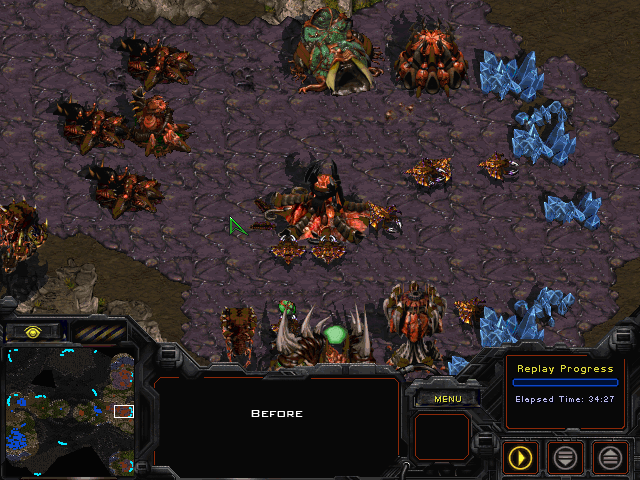 Back at the Main, I have a Creep Colony mutating next to 3 Hydralisks. As I begin mutating it into a Spore Colony, I see the Dark Templar from the Natural approaching, in sight of my Overlords in my Main. It was battle-scarred from my failed experiments in Hydralisk-Overlord coordination, and it quickly bursts into blue smoke as I focus my Hydralisks on it. My nerves are shot, my hands are still shaking, and the anticipation of an attack is killing me. I decide to uproot 12 Zerglings from the map center and see what Dank has at his base. As they approach the Natural, I see a thick wall of Photon Cannons covering the choke. The Zerglings begin to cross the Cannon line, and I go back to figuring out a way to quell the Corsair menace. All of a sudden, I see the Victory button in the middle of my screen. I have no idea what has happened. I was certain that he was building a Carrier fleet with Arbiters to Recall into my base, or something equally horrific. At first, I think he got bored and left, but I decide to watch the replay to be absolutely certain. Dank begins with a build order as strange as my own, but designed around a strong economy for a long game. He built a Gateway at 7 Probes, followed by an Assimilator and a Forge. He then placed 2 Cannons and a Cybernetics Core near the Gateway. His build order was evidence enough for the first, and the first was evidence enough for the second. For one thing, his Cannon placement was such that they would neither protect the mineral line nor block any attack on the buildings, and he didn't seem to have knowledge of any build order I've ever heard of. Had my timing been better, my Zerglings could have arrived sooner and the game would have been over, because the first Zealot did not arrive until my Zerglings were in the mineral line. The subsequent Zergling rushes are sloppily dealt with, and instead of investing in an army to fend off the attacks, Dank blocks the space between the Assimilator and mineral patches (where my Zerglings were running in) with a Cannon. At 8 minutes into the game, the first few rushes are over, a Robotics Facility goes up, and Level 1 Ground Weapons is researching. Dank starts producing Dragoons, but places them further out than the Zealots. A Stargate is placed South of the Gateway just before my Zerglings attack from the Southeast. After the Zerglings are dead, Dank places even more Cannons and starts building Corsairs. A Fleet Beacon goes up West of the Cybernetics Core, Level 1 Plating and Plasma Shields are researching, and more Cannons are placed. Disruption Web and Argus Jewel are researched for the Corsairs, while more Zealots, Dragoons, and Corsairs are produced. A Robotics Support Bay is placed while all 5 Corsairs head East. Where I had to scout both wrong positions before I knew where Dank was, he found me on his first guess; he had not even found his ramp, and still hadn't even scouted anywhere. While the Corsairs are attacking my Overlords, Dank places another Cannon and sends a few Zealots and Dragoons to the West edge of the map center. He then queues up 4 Reavers and researches Scarab Damage. An Observatory and Citadel of Adun are placed in accordance with the Close Placement Act of 1998. Then, as the fourth Reaver arrives, the other 3 move out and Dank notices that his Main is nearly mined out. In reaction, he places 2 Pylons and 1 Nexus at his Natural. The 3 Reavers reach the small Zealot/Dragoon force at the map center, just as my Zerglings arrive with the Ultralisks in tow. Each of the 3 Reavers has 0 Scarabs. Shocking. Some Scarabs are produced during the battle, but only one is fired off before it's over. At this point, I'm wondering if Dank understands high-level Protoss units. Dank places another Cannon and an Assimilator at his Natural, which is now operational, but no Probes are sent to mine there until the last mineral patch in the Main has less than 200 minerals. He also queues more Zealots and researches Leg Enhancements. Even more Cannons go up at the Natural choke, but not enough to block the Ultralisks that will arrive in my next attack. The 2 remaining Reavers have now been fully loaded, but one is still in the Main. The other is slaughtered by the Ultralisks, and although the Corsairs destroy all 6 Mutalisks without a dent, they can only look on in horror as the Ultralisks charge on towards the Natural. Dank now has 800+ minerals and 1400+ gas, but instead of queuing more units to halt the approaching Ultralisks, he sends the last of his ground forces, 1 Reaver, out to the Natural to meet them. The Reaver kills one Ultralisk, and dies as its second Scarab is released to kill a second Ultralisk. Ironically enough, Dank's investment in Cannons pays off, killing the last 4 Ultralisks and saving his base. Now that the battle has ended, Zealots are queued up, the second Gateway (that's right: 2nd Gateway at more than 22 minutes into the game) is placed in a corner along with a Templar Archives. After the Archives are warped in, 6 Zealots, and 2 each Dragoons, High Templar, and Dark Templar are produced. After 6 Scourges attack the Corsairs ("nice try") Scarab Capacity is researched and 1 Reaver queued. Unfortunately, Dank realizes too late that the Close Placement Act of 1998 was overturned for a reason: his new Dragoons are trapped by several Cannons and Pylons, the Fleet Beacon, Templar Archives, Citadel of Adun, Robotics Support Bay, and the Gateway from which they came. The 2 Dragoons begin to dance with each other as Mutalisks approach from the Southeast. After the Mutalisks are repelled, Dank places yet more Cannons in a panic. The Natural choke is sealed with three layers of Cannons, thus trapping all large units. More Dragoons, Reavers, and Corsairs are queued. Nothing has been researched at the Templar Archives. Now comes the Guardian Attack on the Natural. The Reaver that had appeared to be sent in retaliation, was actually headed for the map center, but deterred by the Cannon block. The Corsairs come in just too late to save any of the mining Probes. I had not realized how crucial a turning point this was in the game. Dank has 2 Probes left, which have only survived through sheer luck: one was building the Cannon wall in the Natural, just outside the range of the Guardians, and the other was building Cannons in the Main. There are 366 minerals available, and units still producing. Instead of canceling some Zealots, Dank spends all but 6 minerals on Scarabs. 1 Probe begins long-distance mining, while the other is accidentally selected with a Dragoon and sent to the map center to join the Zealots, Dark Templar, and High Templar. Nothing has been researched at the Templar Archives. Dank's meager force crosses the map center without the Dragoons and Reavers. Instead of building a Shuttle, he ignores this problem, and Zerglings focus on the High Templar. Nothing has been researched at the Templar Archives! Both High Templar are killed, helpless to defend themselves. The remainder of the Protoss forces move in to my Natural, and only 1 Dark Templar survives the battle. The Corsairs go Overlord hunting, while a second Probe is produced at the Main Nexus once Dank has 64 minerals. Confident that he can force a Surrender, Dank moves his Dark Templar in to the main, only to have him shot down by Hydralisk spines. Now, the game is effectively over; when I send in my Zerglings, Dank only has 3 Probes mining long-distance, 28 minerals and 795 gas. There are Photon Cannons everywhere and some Dragoons and Reavers still in place inside the Main, but he surrenders. Now, I will proceed to sum up the match and analyze some of Daddy_Dank's tactics. I don't know Dank personally, and I have not heard of or from him since our battle some months ago. So, I will have to assume that he has a similar mental capacity to that of the average human being. I will also draw conclusions based entirely on this one match; if he is still playing on Battle.net, I hope he's learned a thing or two since this game. Dank did many things that are characteristic of Campaign-Mode play. 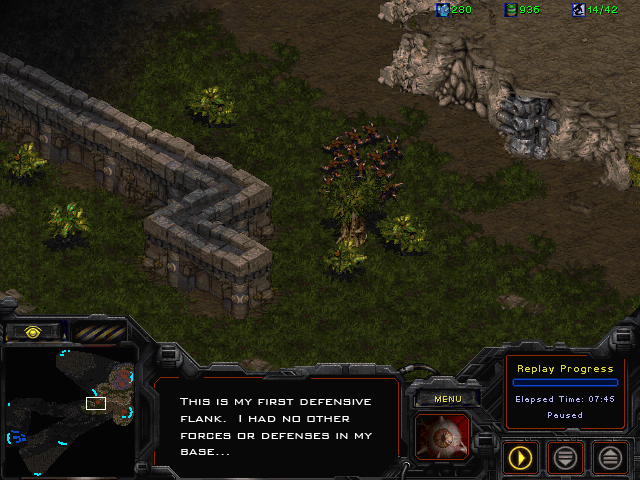 This seems to be a common phenomenon in StarCraft. 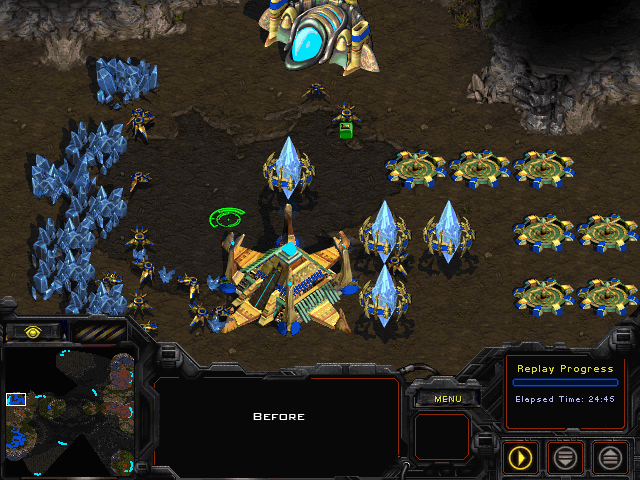 The explanation I can offer is that people who are new to online RTS gaming, and therefore to StarCraft as well, but not new to video games, will play the Campaign first in order to be better accustomed to gameplay. Then, the assumption is made that online strategy is nearly the same, and the player proceeds to lose several subsequent matches. 1) Reavers were sent out of the Main and into battle without Scarabs, and Scarabs were not built until after the battle had begun. All of this suggests that he didn't finish the Protoss campaign, if he even played it at all. However, he knew about Pylons, Assimilators, and Nexi, which suggests that he played the tutorial mission, watched a pro game, or both. Of course, waiting to place the first expansion until after the Main is dry is an outdated tactic. This would suggest he was an old player using an off-race, if it were not for his slow reaction time and tight building placement. My final analysis of Daddy_Dank is a typical casual player. Someone vaguely familiar with parts of the StarCraft universe, but not very serious about becoming any good at it: someone in it just for the fun. In that way, he's a lot like me. The first of my two games that day was a clean, quick, humiliating defeat at the hands of a competent Terran player, and I was not confident after my rushes had failed in this second game. In fact, I believe I had given up all hope after the 3rd rush, and was just trying to produce a massive force of Ultralisks for fun. I once relied entirely on the quick game-ending rush, and I had no contingency plan should the rush tactic fail. When I decided to go with mass Ultralisks, I couldn't really stick to it because my economy wasn't keeping up. I never made Hydralisks, even when the Corsairs were a serious threat. This was because I had lost hope in Hydralisks. At the time, I considered using them a lot like throwing water balloons at my enemy. 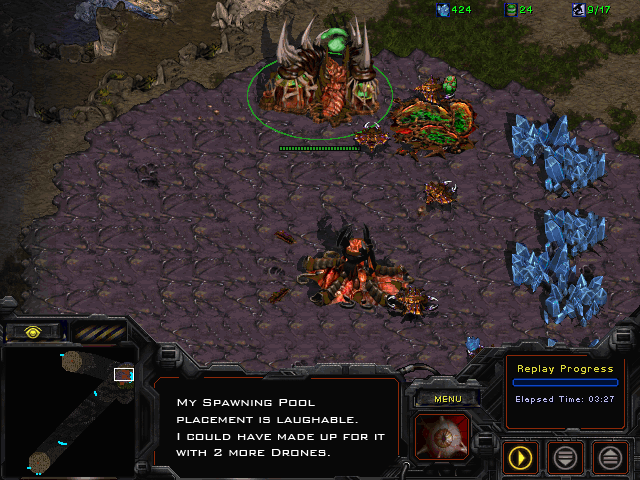 I had never used them in large enough numbers, so whenever I did use Hydralisks, they evaporated before my eyes. In a way, I was the antithesis of Dank: I had never played the campaign, and only before gone up against my roommate and his friends. I'd only played against a Protoss player who always used the mass Dragoons to Carriers strategy, so my extended rush tactic had been formed as a result. Since this game, I've also played through the campaign, begun to integrate myself in the StarCraft community, and become a Random player. Now, I will take a moment to acknowledge the brave Dark Templar from this match. In the face of Sunken Colonies, Zerglings, Mutalisks, and Ultralisks many times his size, he survived the second of two great battles. Of his 28 kills, 5 of the following buildings: 1 each Extractor, Queen's Nest, Greater Spire, Ultralisk Cavern, and Hatchery. This Dark Templar was battle-scarred by the end, and was shot down by 3 Hydralisks under the revealing eyes of an Overlord. All sarcasm aside, this was a very odd game. So often there was absolutely nothing going on, both Dank and myself appeared capable of only one thing at a time, and I imagine neither of us exceeded 30 APM over the course of the entire game. The only unusual occurrence was the use of Mutalisks and Scourges against Corsairs (I now know that Corsairs cannot attack ground units). And so, I will leave you with this short explanation about something inconsequential. FINAL NOTE: After some debate, I decided to not withhold the gamertag of my opponent: Daddy_Dank. I have not encountered him since our first game on Battle.net, and he does not appear to be a part of the StarCraft online community (sc2gg, teamliquid.net, et al). Although I did find a rapper by the name Daddy Dank, I doubt he was my opponent, or that if he was, he shouldn't care. Furthermore, both of us played equally awfully, so if I'm willing to put myself out there, I reasoned that Dank should as well. I do not have his explicit permission to discuss this game, but I really don't care.